Ingrid Seward is an old-school royal watcher/commentator and biographer. Seward has access to Charles and Camilla on a regular basis, and she used to go back and forth on William and Kate. Like, she was perfectly capable of launching scathing criticisms at them years ago, but ever since Meghan came on the scene, suddenly Seward is all about embiggening Kate. Seward was the same commentator who made ?Meghan?s American table manners? a thing, remember that? My point is that Seward is? a commentator with complicated loyalties, and I?m not sure what to make of her comments in the new issue of People Magazine. It?s about how Meghan is doing her delivery differently than Kate and how that?s perfectly fine. Or something. Meghan Markle is choosing what?s right for her ? and her baby. While many expected the Duchess of Sussex to follow in the footsteps of Kate Middleton and Princess Diana when it came to welcoming her child ? by delivering the baby at the Lindo Wing of St. Mary?s Hospital and introducing the newborn to the world with a photo call outside ? Meghan and Prince Harry recently announced that they?ll be keeping the exact plans private. ?People are delighted that Meghan is doing things differently,? royal author Ingrid Seward tells PEOPLE in this week?s issue. ?She was under no pressure to do things the same.? Instead of posing outside the hospital with their new son or daughter as Kate and Princess Diana did, Meghan and Harry announced that they will take part in a photo op with their new baby on the grounds of Windsor Castle, where they recently moved into their new home of Frogmore Cottage, in the days following the birth. Where Meghan gives birth will not be publicly shared, but it?s highly unlikely that she will chose St. Mary?s Hospital. ?It is completely understandable,? royal author Ingrid Seward tells PEOPLE in this week?s issue. ?The Lindo Wing has become too much of a circus.? It?s true that the Lindo Wing has become ?too much of a circus.? Kate?s answer to that was to just to lean in and really create a tight schedule of bringing out the baby, posing happily and then being whisked away. I always thought that Kate?s first delivery George was rough and she felt like hell, but for Charlotte and Louis, she seemed so happy and pleased with how quickly everything happened. But yes, it?s still a circus and I don?t blame Meghan for not wanting to participate in it at all. I?m surprised that Ingrid Seward is also not bashing Meg for it. It really feels like the British papers would have people convinced that it?s Meghan?s DUTY to trot out her newborn as soon as he or she pops out. Photos courtesy of WENN, Avalon Red and Backgrid. Even before then-Kate Middleton married Prince William, I was convinced that there was some shady stuff happening with the Middleton finances. The Middletons made their fortune with Party Pieces, at least that?s the official story. I never doubted that Party Pieces was a profitable start-up company from Carole Middleton, just as I never doubted that Carole has a true entrepreneurial spirit. What I doubted was this idea that the Middletons amassed a reported 40-million-pound fortune from selling cheap party supplies. I think they probably made enough for a comfortable middle-class life, but this whole ?the Middletons are rich AF because of Party Pieces? idea was just PR. I still believe that the Middletons? keeping-up-with-the-Joneses lifestyle was supplemented quite heavily by shady Uncle Gary. Well, now the Daily Mail (and The Sun) has an interesting story about how Party Pieces might be facing some hardships. Huh. The party supplies company run by the Duchess of Cambridges mother has dismissed some of its staff amid fears for its future, it was claimed last night. Party Pieces, run by Carole Middleton, is said to have laid off at least three of its staff on Wednesday and a fourth worker was told they were at risk, although there were claims up to half of staff members were let go. The abrupt dismissals come months after three warehouse employees were laid off before Christmas. The companys web designer, PR agent and search engine optimisation employee were among the recent firings. A shocked source told The Sun: There is a terrible air of doom and gloom about the place. Another source told The Sun: There wasnt so much as a Christmas tree or festive decorations in the office. Morale is at rock bottom. Well, that?s certainly interesting, isn?t it? I always thought James Middleton noted supplier of Nazi marshmallows was the black sheep of the family because he has no head for business. But maybe Party Pieces was always something of a shell game. I?m being too harsh, I know it?s more than possible that Party Pieces was a well-run and profitable business for years and years and because of the changing dynamics of this particular niche market, Party Pieces is failing right now. I wonder if Party Pieces does go under, will royal reporters start telling the truth about the Middleton family?s finances though? They were never as rich as they claimed. Prince William even gave the Middletons a significant chunk of money to buy their upgraded home in Bucklebury. The Cambridges and Sussexes? joint appearances at the Commonwealth Day church service at Westminster ended up being kind of non-story from a gossip perspective. 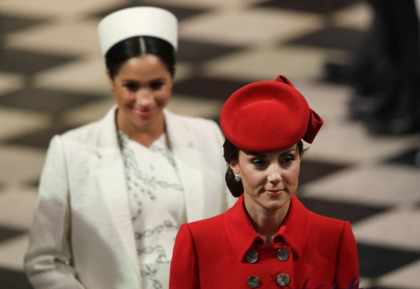 Sure, we talked about Meghan?s fug nurse?s hat and Kate?s buttons, but there was no real scandalous or controversial moment between the couples. It reminded me a lot of the Christmas Day walk at Sandringham Kate and Meghan were doing all of the heavy lifting of going along and getting along, and they were both definitely trying to be SEEN getting along. Meanwhile, the vibe between Harry and William seemed similar to Christmas too like Will and Harry have had a serious falling out and it?s still not okay between them. Anyway, Meghan and Kate greeted each other with a friendly cheek-kiss at Westminster, which was enough for Katie Nicholl at Vanity Fair to point out that ?sources? insist that Kate and Meghan have completely buried the hatchet. The kissy greeting at Westminster: According to a Palace source, Kate Middleton?s unusual public gesture was deliberate?she hoped the warm embrace would be captured by the world?s media and finally put an end to the rumors of an ongoing feud. Meghan?s last event? Vanity Fair has been told that the Commonwealth Day service was the last official royal engagement that Meghan Markle, who is believed to be eight months pregnant, will carry out before she gives birth, although she will continue to take private meetings, and Kate was keen to send out the right message before Meghan and Prince Harry have their baby. A source claims Kate wants to keep everything professional: ?They might not have a huge amount in common but Kate has no issue with Meghan. She wants them to get along, not just for Harry?s sake but because two royal sisters-in-law at loggerheads wouldn?t be good, and Kate knows that. For Kate, it?s about keeping their relationship professional and putting on a show of togetherness.? The Sussexes & Cambridges have been getting along better: As Meghan nears her due date, she and Kate have apparently been in regular touch. 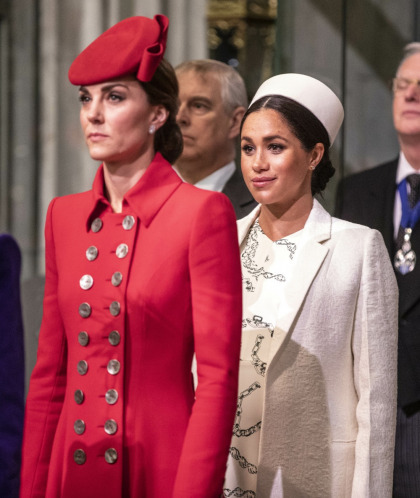 There has long been reason to doubt the reports of a feud between the two women, though there was indication last fall that Harry and Prince William were experiencing some tensions. Now they?re said to be getting along well, and there were no sign of any distance between William and Harry on Monday. However, joint appearances between the ?Fab Four,?? as they have been known, won?t be frequent from now on. Kate has been making the effort: ?It?s not always been easy, there have been issues behind the scenes, but Harry and Meghan want to leave on good terms and Kate especially has been making a real effort,? says a second source. ?There are no bad feelings and I think Kate was keen to put an end to these rift rumors. She has no problem with Meghan and she has made it clear to Meghan that she?s there for advice or whatever Meghan might need.? I enjoy this story for the subtext most of all ?Harry and Meghan want to leave on good terms and Kate especially has been making a real effort.? I suspect William has not been making a similar effort. Possibly because it was never really about ?the duchesses at war!? as much as it was about William and Harry?s falling out. That being said, this is such a dumb way to position this story, like Magnanimous Future Queen Kate is a brilliant internal-politics diplomat who is the only one who understands that she has to get along with her sister-in-law. I guess Meghan didn?t have any agency in the whole ?duchess feud? thing, huh? Before the smear campaign, before the Royal Sussex Tour, before all of it collided into shambles, I said that it was notable to see how quickly Meghan Markle was being folded into the royal family. Meghan and Prince Harry?s courtship was fast for royalty, and the Queen seemed especially keen to accept Meghan quickly, and to show her the ropes and do events with her. I said at the time that the Queen was making a point of accepting Meghan and being SEEN accepting Meghan. The Queen is crafty and smart she knows that there will be hell to pay long-term if the royal family wages a racist and hateful campaign against the first woman of color to marry a blood prince. The Queen also knows that it?s good for the monarchy, long-term, if the family actually starts to look like the racially diverse people who recognize the Queen as THEIR Queen. It sounds obvious. But ?royal experts? get paid to say this sh-t on camera. The Queen sees Meghan Markle as a very useful tool for the monarchy, a royal expert has claimed. Her Maj is said to be very fond of the Duchess of Sussex despite reports of a seething rift between Meghan and sister-in-law Kate Middleton. But a royal expert says that the Queen also views Meghan, 37, as a useful tool for modernising the royal family. 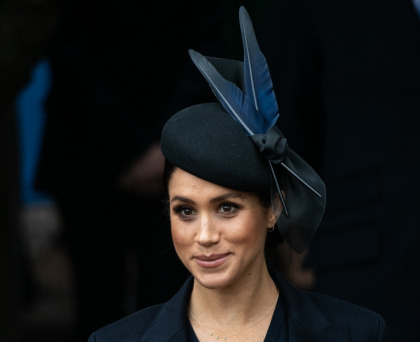 And she claims in a new documentary that the former Hollywood actress who married Prince Harry in May may have helped secure the House of Windsor for decades. Imogen Lloyd, Royal Contributor for US station ABC, appears in the new documentary Meghan?s New Life: The Real Princess Diaries. In the programme, Ms Lloyd says: The Queen is incredibly smart. The Queen sees Meghan as a very useful tool in securing and symbolising the future of the monarchy for decades to come.? I think this is true and also? it?s going to be more difficult than the Queen initially thought. It seems like it?s going to be a more delicate balance than previously believed, with the racist press smearing Meghan at every turn, and Work-Shy Will throwing tantrums and the Keen Defenders wanting to classify Meghan and Harry as ?minor royals? now. Oh, well. The Queen did what she could. Meanwhile, this clip has gone viral allegedly, William is giving Meghan the cold shoulder here. I don?t doubt that he?s given her the cold shoulder in general, but I don?t think that?s what?s happening in this video. Kate?s turning point: Post-maternity leave and with Meghan around, ?It?s a huge turning point,? said Susan E. Kelley, the owner, editor, and Middletonian obsessive behind What Kate Wore. ?I think this is where Kate gets to make her markA couple of years ago, you might still have seen her being a little bit timid. Now, she seems like she?s in a more take-charge position. I?m beginning to see the person who?s going to be the queen emerging.? Kate is a senior royal now: Kate is ?no longer the ?commoner? who married into the family but the future Queen Consort and mother of the future King. The role of princess-in-training has been passed on to Meghan?who, as a former actress and longtime humanitarian, is already perfectly comfortable in the public eye, but is just getting started with her own royal family and working with her chosen causes, including girls? education. Kate has graduated to an unspoken Level Two, where she is more free to pursue her own passions?including mental-health issues, underprivileged children, and art?in a more targeted way. Kate finally knows what she wants to do: ?She found her role as a working member of the royal family through bringing up her own children and realizing what?s important to her,? said ABC News royal commentator Omid Scobie. ?One of the things that we?ll see her really focusing on for the months ahead is working to help support disadvantaged children in the U.K. . . . Kate has this plan in place to really work with a number of organizations, including the Royal FoundationIf you look at Queen Elizabeth, she has that strength without really saying much, that has held this country together through some of the the fiercest wars and times that we?ve faced. I think Kate has the ability to do the same.? Katie Nicholl?s take on Kate?s ?work-shy? label: ?She?s a mother, first and foremost. Her children are going to be her priority while they are young, and she will juggle her work commitments around the kids. The Duchess of Cambridge has been labeled work-shy in the past. But, actually, she?s taken on just a few patronages, things where she?s really made a difference. Early intervention with young children in primary schools, putting mental health on the map with Heads Together, was her idea. She?s been very instrumental. Nicholl believes Kate is ?quite grateful? to Meghan, not jealous: ?People who are often saying ?Well, is she jealous of Meghan?? She?s really not. Kate is happier in her life now than she ever has been. She has everything she wants. She has William, she has three beautiful children . . . she is where she always wanted to be,? Nicholl said. ?The fact that there is a new glamorous sister-in-law in tow is not going to worry her one bit. I think Meghan came at the right time for her, because it was at a time when Kate wanted to step out of the spotlight.? Sigh? I understand that Kate is more conservative and she has to be more conservative, because she?ll be a Queen Consort eventually. But I?ve never understood the point of waiting around and doing next to nothing just to avoid controversy because you?re going to be queen in 25 years. The argument seems to be ?well, different people are different, and Kate just wants to have a quiet life with her kids and her shopping, she doesn?t want to change the world.? And maybe that?s good enough for some of the British subjects. But if you?re paying for all of this upkeep, don?t you want a bit more? Don?t you want someone who understands their soft power and has passions beyond her kids? I don?t know. Anyway, we?ll be back here in another five months with another story about how Kate plans to be super-keen eventually. In case you forgot, Prince William is in Africa this week. Kensington Palace?s Twitter has been full of photos of William doing work mostly conservation work in Namibia, Kenya and Tanzania. It feels like William?s trip has been mostly ignored by the British and American press, which is both a good and bad thing. It?s a bad thing because William also has a vein of ?don?t forget about meeeee? in the wake of the Duchess of Sussex?s entrance into the royal fold, and I bet he?s irritated that his trip is barely being covered. It?s a good thing because William is still William, and he actually doesn?t want to provide a full accounting of what he?s actually doing every day during his trip, which is why the KP Twitter is stage-managing the rollout of information to make William look consistently busy (when he?s probably hanging out with Jecca Craig as we speak). Anyway, I bring up William?s trip because his wife made a point of stepping on his messaging. While William was away, Kate announced her first big event since her summer-long maternity leave. Kate will visit Sayers Croft Trust Forest School and Wildlife Garden next week, on Tuesday October 2nd. Don?t forget about meeee?.! Quite honestly though, I think Kate is genuinely feeling more relaxed than ever. Yes, there was the Don?t Forget About Me Tour late last year and earlier this year. But I think Kate also realizes that with Meghan on the scene, Kate doesn?t have to worry about ?getting her numbers up? by the end of the year. Everyone is focused on Meghan?s events now, which means Kate feels free to still be on partial maternity leave until next year. Kate Middleton is getting back to work ? now of three! After stepping away from royal duties ahead of the birth of Prince Louis on April 23, the Duchess of Cambridge will visit the Sayers Croft Forest School and Wildlife Garden at Paddington Recreation Ground on Tuesday, marking the end of her maternity leave. Kate will learn how the school exposes thousands of urban students each year to nature and meet children participating in outdoor activities. ?Her usual busy schedule? LMAO. After seven years of duchessing, we know that Kate?s schedule has always been ?sporadic.? The only difference now is that Kate isn?t this year?s big show, so there?s less pressure and expectation for her to be anything other than what we already know: someone who really couldn?t care less about duchessing. Maybe I?m just using this story as an excuse to post as many photos as I can find of the Duke and Duchess of Sussex touching each other. Would that be so wrong??? This week?s People Magazine cover story is all about Meghan and how she?s adjusting to royal life after two months. The first part of the cover story was about how Meghan gets frustrated with all of the dumbass ?rules? and ?protocols? she?s supposed to follow, for example the whole ?women must wear skirts or dresses? thing. It?s not actually a rule or a protocol, it?s merely a preference of the Queen and the only people who care about that preference are nitpickers in the British media. Anyway, another part of the cover story is apparently about how tactile Harry and Meghan are with each other. Which I?m sure involves many lustful, sweaty broken protocols. As soon as Prince Harry and Meghan Markle went public with their romance last year, it was clear that they were not afraid to show PDA. And those displays of affection have continued since Meghan became an official royal two months ago. ?They are not afraid to hold hands. They don?t mind showing their emotions,? veteran royal photographer, Mark Stewart, tells PEOPLE in this week?s cover story. Harry and Meghan memorably walked hand-in-hand at the Invictus Games in Toronto in September 2017 (their first public event!). The moment was a big deal to royal fans as members of the royal family (like Harry?s brother Prince William and Kate Middleton) rarely show PDA ? especially at official outings. Those moments of intimacy have been on display at almost every event they?ve attended together (aside from their appearance alongside the Queen!). ?Meghan is used to being touchy-feely, and Harry is the same,? former palace spokesman, Dickie Arbiter, tells PEOPLE. ?Harry has always been tactile.? 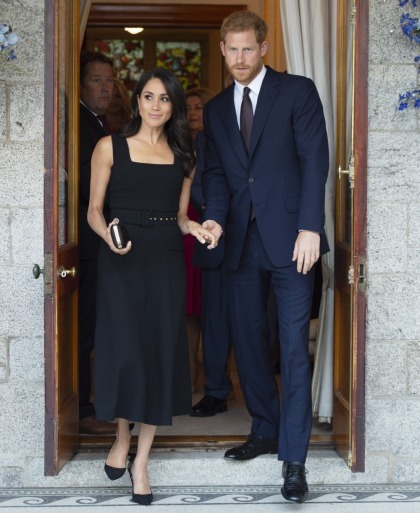 ?While Prince Harry and Meghan holding hands is atypical for royal engagements, it is a seemingly welcomed gesture to show unity and celebration of their engagement period,? royal etiquette expert Myka Meier, founder and director of Beaumont Etiquette, told PEOPLE. ?There is no protocol that says they can not show affection on official engagements, and this gesture makes them relatable and lovable to the public. Meghan and Prince Harry holding hands at a royal engagement is a refreshingly modern approach to their new role both as a couple and as representatives of the royal family.? People always talk about how Meghan specifically is doing the wrong thing or breaking some rule by holding Harry?s hand, but it?s not said enough: Harry is touchy-feely too. Not just with Meghan, with everybody. He?s his mother?s son in that way Diana was very tactile and she loved to hug, embrace, hold hands and simply be close to people. Harry is the same. He was always going to end up with a woman who would touch him and hold his hand and want to be physically close to him. And yes, it is refreshing and I wish we would get more of it. Kate Middleton is putting pen to paper ? to talk about her love of art! Princess Kate, who is the patron for London?s National Portrait Gallery, is set to open the exhibition Victorian Giants: The Birth of Art Photography, on Feb. 28. And ahead of the exhibition?s opening, she penned the foreword to the exhibition catalog, where she talks about her passion for the subject of photography ? and her love of pictures of children, in particular. The exhibition will explore ?the birth of art photography in England,? Kate writes in the page-long foreword and will contain photos from Julia Margaret Cameron, Lewis Carroll, Oscar Rejlander, Clementina Hawarden and more photographers from the Victorian era. It will also focus on photographs of children, a subject Kate, who frequently snaps official photos of her kids, Prince George and Princess Charlotte, is well familiar with. ?Children held a special place in the Victorian imagination and were celebrated for their seemingly boundless potential,? Kate writes. ?This notion still rings true for us today and it underpins much of my official work and the charities I have chosen to support, and, indeed, my role as a young mother.? Kate, who dubbed herself an ?enthusiastic amateur photographer,? is something of an art buff: She studied art history at the University of St. Andrews ? where she met Prince William in the their shared freshman dorm. This exhibition in particular has a special connection for Kate, as this era of photography was the focus of her thesis in school. ?As a student at the University of St. Andrews, I chose it as the subject of my undergraduate thesis and photographs of children in particular, which feature prominently in the exhibition, are of real interest to me,? 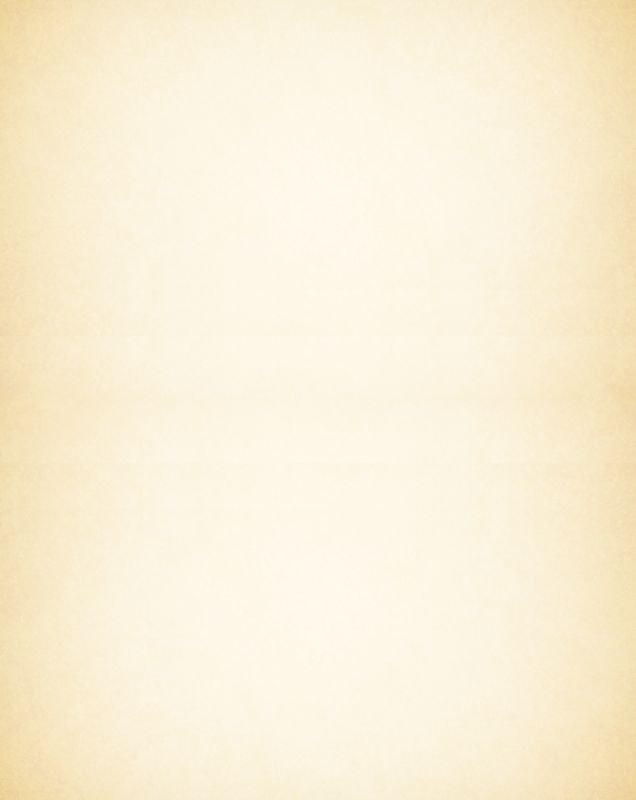 she wrote. The opening of the exhibition is set for Feb. 28, and Kate will attend the event at the National Portrait Gallery solo. It?s a reminder of her pregnancy with Prince George ? just a few months before giving birth to her eldest child, she attended an event at the National Portrait Gallery in April 2013. I?ve spent how many years writing about Kate and this is the first time I?ve read that her university thesis was about Victorian photographs of children. This actually explains a lot about Kate – she?s always had a sort of throwback vibe, sometimes a throwback to the 1950s ideal of the role of womanhood. But she?s also had that Victorian vibe too, in her clothing and her view of her ?role? as a duchess and wife of the heir?s heir. I often called this her Downton Abbey cosplay, but Downton Abbey was actually set in the Edwardian era, not Victorian. Kate would prefer to be buttoned up and bustled and to just think of children and the empire, thank you very much. Duchess Kate repeats a blue Seraphine coat in London: super-cute? Man, I have not been keeping up with the Duchess of Cambridge?s schedule. Usually, her schedule is so sparse that her events are announced a month in advance, and they?re spaced out to, like, twice a month. But Kate is actually doing more work in January than she?s ever done in before. And I can?t keep up! Today, Kate was in London for two events highlighting postpartum mental health for moms. Her first stop was the Maurice Wohl Clinical Neuroscience Institute, and her second stop was the Mother and Baby Unit at the Bethlehem Royal Hospital. As she rounds the corner into her third trimester, Kate Middleton is highlighting an issue that affects millions of mothers. The royal mom, 36, stepped out in London on Wednesday for back-to-back engagements focusing on postpartum illnesses ? the day after she gave a rare speech highlighting the need for children?s mental health support. Today?s schedule kicked off with a visit to King?s College London, where Kate ? wearing a blue Sraphine coat and the same floral print Sraphine dress she has worn twice before ? stopped by the Maurice Wohl Clinical Neuroscience Institute. Her agenda included visiting the on-site laboratory to receive a briefing on its work on perinatal research before meeting with experts conducting research in perinatal psychiatry. Kate?s next stop is set for the Mother and Baby Unit at the Bethlehem Royal Hospital, part of South London Maudsley NHS Foundation Trust. The unit specializes in the treatment of postnatal depression and postpartum psychosis. Sometimes I have great recall for Kate?s clothing, but this was not one of those times. I completely forgot about this Seraphine coat, which she?s worn before. Looking at the old photos, it feels like Kate took an off-the-rack piece and had it awkwardly tailored, and she definitely moved the hemline up. I still think that she did that in these new photos? Then again, all of Kate?s Shades of Blue coats have all started to blend together for me. All that being said, I think she looks super-cute here. I love it when she wears a ponytail, and I always think pregnancy ?softens? her so much. She?s one of those women who will look ?suddenly? pregnant too – like she?s barely showing for months and then all of a sudden, she?s waddling around with a sizeable bump. She?s got months to go though!